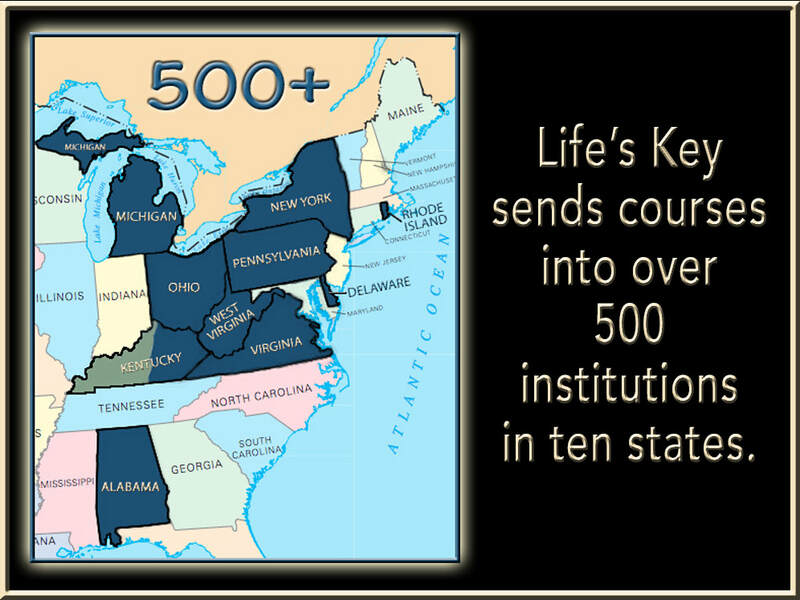 In 2015, Life's Key sent 25,664 courses to current and former inmates. In the coming years our goal is to share the light and love of Jesus while reaching an even greater amount of souls for the Lord. Click on the buttons below to see locations and information about our ministry in each state. Know an inmate who needs to know the truth found in God's Word? Send their information by filling out our form. The Bible is of God, inerrant in the original documents and of final authority in all matters and practice. The Lord Jesus Christ is fully God, born of a virgin, perfect, without sin. His sacrifice is substitutionary and representative. He rose bodily from the dead and ascended to His Father’s right hand, where He now ministers as our Great High Priest. He will come to rapture His church and subsequently return to reign over the earth. Each member of the human race is fallen, sinful and lost, and regeneration by the Holy Spirit is absolutely essential for the salvation of man. Redemption is wholly by the blood of Christ, and salvation is by grace, through faith in our Lord Jesus Christ. The Holy Spirit indwells the believer who is thus empowered to live a godly life. There will be a resurrection of the saved and the lost, of the saved unto eternal life in heaven, and of the lost unto eternal and conscious judgment. The Church began with the descent of the Holy Spirit at Pentecost and is composed of all true believers in the Lord Jesus Christ. The indwelling Holy Spirit unites to Him and to one another these believers. The Church’s chief calling, hope, and destiny are heavenly, and its chief functions are to glorify God and to witness for Christ until His return. There are two Christian ordinances, Baptism and the Lord’s Supper. Baptism by immersion signifies that the believer, having died with Christ, is buried with Him in Baptism and is also raised with Christ to walk in newness of life. The Lord’s Supper is a memorial feast, instituted by the Lord Himself exclusively for His own. Every true child of God possesses eternal life, and being justified, sanctified, and sealed with the Holy Spirit, is safe and secure for all eternity. The personal imminent return of the Lord Jesus Christ to translate His church will be followed by the Tribulation and the inauguration of Christ’s reign over the earth; He will then deliver up the Kingdom to God the Father, that the Triune God may be all in all. All pages within this Internet site are the property of Life's Key and Emmaus International. No portion of the materials on our pages may be reprinted or republished in any form without the express written permission of Life's Key Ministries.